A few amazing aspects of soccer is its unpredictability, drama, and of course, the beautiful play. Before the final, I thought Italy the better team. They played wonderfully in their overtime against Germany. They were also more creative, more fluid, and more talented in their play. France, on the other hand, seemed very disciplined, They could stifle any team’s aggression and forcing their opponent into a net from which they couldn’t master any meaningful attack. As a whole, games that involved the revived France seemed dull (vs. Spain, vs. Brazil, vs. Portugal). France commanded respect for their success in breaking their opponent’s flow. But as an audience, i much prefer Italy’s dynamic and the sense of fun. The World Cup final on July 9th turned out very different from what i had expected. Even though Italy still won at the end. Something was amiss. First of all, Italy played very well in the first half, despite the referee’s overreacted penalty kick award to France five minutes into the game. It was like the France-Portugal game all over again. I was furious! But Italy got even soon enough. It was a beautifully played first half. I was happy, all was well. Then came the disappointing second half. Italy decided to just lay back and wait for attack to come to their door. France didn’t disappoint, they organized attack after attack, and Italy didn’t seem to care. The overtime is not any better, all my hope for Italy to pull another Italy-Germany game was vanished. Italian players continued playing half dead. France was still organized and spirited. What the hell was wrong with the Italians! They looked like ready to give up the cup already! Then came the unthinkable. The quiet, humble, cool Zidane was sent off for astonishing violent behavior on the field, away from the ball! The video feed repeated the replay over and over again, from various angle, starting from various point proceed Zidane’s attack on Materazzi. 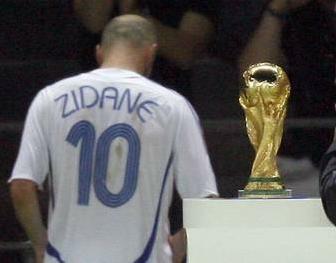 Watching Zidane walking past the gold cup, disappearing in the tunnel, it was a sad moment. Even with one man up against the 10-man team, Italian players still looked like they could hardly walk, let alone to run. Italy won PK for the first time in their career and they got the cup. I was happy for Italy, but watching the French team scattered around the field, dumbfounded silence surrounded them. Something was nagging me. What did Metarazzi say to Zidane to cause all this? If Zidane didn’t leave, he could very likely have won the cup for him, for his team, for his country, because he was so well known for his amazing PK. And with his nerve of steel presence, the team would have gone through hell with him to get the cup. What was said that was so bad could cause him to throw all these away? 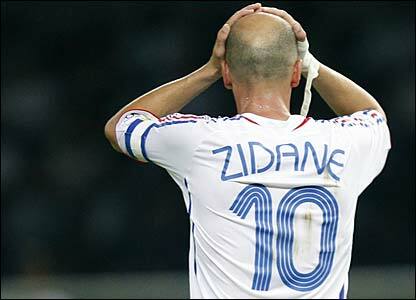 Especially to someone like Zidane, he looked so quiet, so humble in this entire world cup competition? Who is Zidane? Before I started spilling out Zidane’s biographical details, looking at recent headlines out of Europe might help to setup a stage. -Oct. 27, 2005, first night of riot in Paris Suburb Clichy-sous-Bois, initiated 2005 French civil unrest. If you have walked the street of London or Paris recently, it was not hard to recognize the diversity of today’s Europe. Immigrants have taken over a significant percentage makeup of the European society. And Zidane is one of them. He became the idol of many immigration youth. he is well-loved in France. Both were triggered by insulting remarks from the opponent players, targeted at either Zidane’s family, race, or immigration background. What made Zidane’s background more complex was his family belonged to a tribe in Algeria that was called Berber people, they were historically anti-Arabic. First of all, the red card that Zidane received in all three occasions (including yesterday against Italy) was well-deserved, and inexcusable. Now we know what is Zidane’s Achilles’ heel, he won’t take any insult against his family/race/origin. Is it a smart move? Certainly not. In the typical Hollywood ending, the hero will bite the bullet and let the insult come and go, but he will win the cup at the end and laugh back at Materazzi then. But this is not, thank God, a Hollywood movie, and Zidane showed that he was human after all, despite his flawless playing on the field. His god-like statue throughout this cup competition. I wanted to sit back and think about Materazzi’ action, so he is the smart one in this whole episode, isn’t it? He could pick the right moment to stab at the hero, and aimed at his vulnerable spot. Materazzi got his reward, his tactic worked. Does that make him a great football player, though? Does that make him a nobler human being than Zidane? Certainly not. Does Italy really deserve the Cup? after what they did to Zidane? I’m not so sure. And “semi-finalists Portugal won Fifa’s most entertaining team award.” hahaha, FIFA does have a sense of humor. This entry was posted in News & Media, Random Thoughts by Jean. Bookmark the permalink. Hey Jean, of all the “subjective” people, I think you’re almong the fairest. 🙂 Unlike some people –just because they adore Zidane, they “conclude” that everything he does has to be perfect, and whatever he does only makes him more of a hero. And what can a non-hero say to infuriate a hero? Only the most disgusting insult, of course. Not knowing what Materazzi really said, they immediately came to the worst conclusions. And what’s more, they have to vilify the entire italian side as playing dirty tricks. (Reminiscent of some president’s remarks: “You’re either with us, or you’re against us”.) I certainly agree with you that it’s not a hollywood ending, but it’s got some elements of the soap opera.